In the past we’ve always worn heels to the Greenmarket’s swanky annual fundraiser–usually held at some fine hall here in Manhattan–but this time around we’re considering more practical footwear. 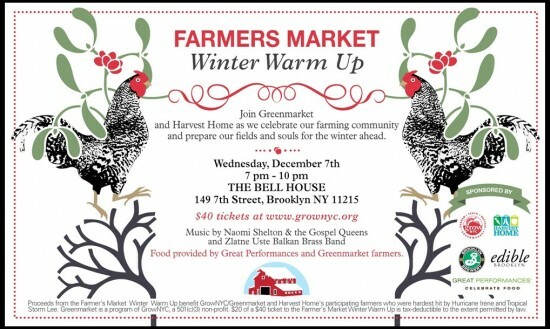 In conjunction with Harvest Home, another non-profit group that runs farmers’ markets in the city, they’re hosting their first-ever dance party next Wednesday night, December 7th at the Bell House in Brooklyn. (It’s just a block or two from the F/R train.) Edible Brooklyn is co-sponsoring the shindig, which they’re calling the Winter Warm Up. In the past we’ve always worn heels to the Greenmarket’s swanky annual fundraiser–usually held at some fine hall here in Manhattan–but this time around we’re considering more practical footwear. In conjunction with Harvest Home, another non-profit group that runs farmers’ markets in the city, they’re hosting their first-ever dance party next Wednesday night, December 7th at the Bell House in Brooklyn. Edible Brooklyn is co-sponsoring the shindig, which they’re calling the Winter Warm Up. It’ll feature performances by Naomi Shelton and the Gospel Queens and Zlatne Uste Balkan Brass Band. The goal is raise funds–in Brooklyn dance party style, natch–for farmers who got soaked by hurricane Irene and tropical storm Lee this past fall, to help them retrench for next year (possibly literally, in some cases). For wallflowers, you can always settle in by the food, which will be farm-sourced snacks made by our friends at Great Performances Catering (they’re helping host the latke fest at BAM on December 19) and beef stew from Roberta’s Pizza in Bushwick, Brooklyn. Hey, that’s not our go-to dancing food, but if they’re making it, we’re taking it. $40, 21+. Buy tickets online.